STATE CAPITOL, PHOENIX – Rep. Martín Quezada, D-Phoenix (District 29), today called for Arizona Superintendent of Public Instruction John Huppenthal to resign after reports surfaced that he authored multiple anonymous blog posts attacking families utilizing public assistance and the Spanish-language media. “Although Mr. Huppenthal has apologized, his comments are absolutely inexcusable. He should take responsibility for his actions and resign from his position. STATE CAPITOL, PHOENIX – Rep. Debbie McCune Davis, D-Phoenix (District 30), released this statement after several members of the Legislature and community leaders submitted an amicus, or “friend of the court,” brief asking the Arizona Supreme Court to review the Court of Appeals’ opinion granting legal standing to the Republican legislators who have filed a lawsuit challenging the bill that expanded Medicaid. In February, the Arizona Superior Court ruled that the Republican legislators challenging the Medicaid expansion legislation did not have legal standing and could not pursue the lawsuit. An appellate court overturned that decision in April. In May, Gov. Jan Brewer and Arizona Health Care Cost Containment System Director Tom Betlach petitioned the Arizona Supreme Court to review the appellate court decision that allowed the Republican legislators to sue. The brief filed today supports the governor’s efforts and urges the court to grant review and reverse the Court of Appeals’ opinion on standing. “Protecting the legislation that provided for the expansion of the Medicaid program is of the utmost importance. Not only because expanding Medicaid benefits to hundreds of thousands of Arizonans will improve our economy, but also because this legal challenge puts the courts in an untenable position. “Partisanship has given rise to this dispute. If the Arizona Supreme Court allows this lawsuit to continue, it will set an expectation that our courts act as referees in political debates. In the case of Medicaid expansion, the majority of the Legislature supported it because our economy and our hospitals needed it. It passed and is already helping people across our state get quality, affordable care. 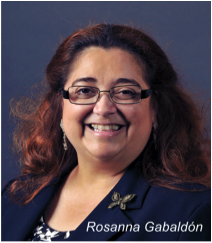 STATE CAPITOL, PHOENIX – Rep. Rosanna Gabaldón, D-Sahuarita (District 2), sent a letter to Gov. 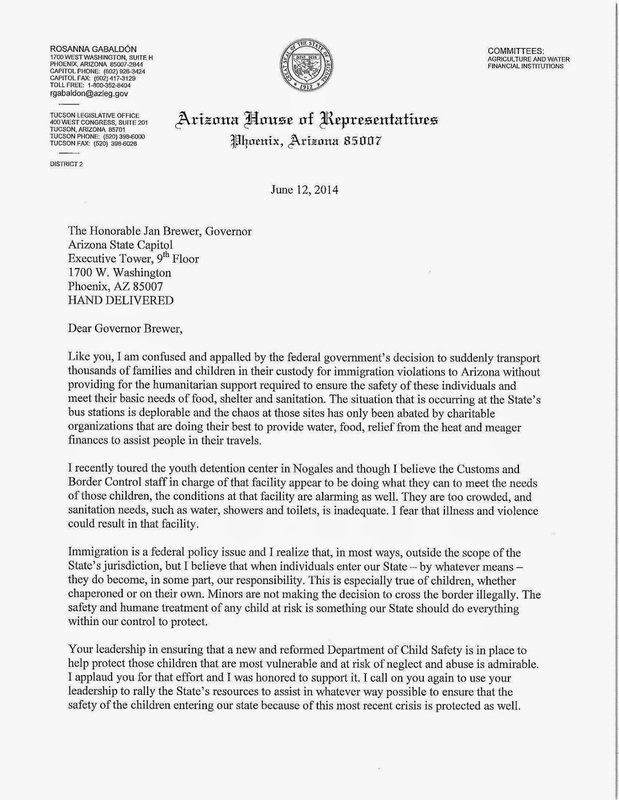 Jan Brewer encouraging her and agency directors to develop a plan to assist the migrant families and children that the federal government has custody of and transported to Arizona. Gabaldón recently toured the U.S. Border Patrol Youth Detention Center in Nogales where federal officials are holding some of the unaccompanied migrant minors. 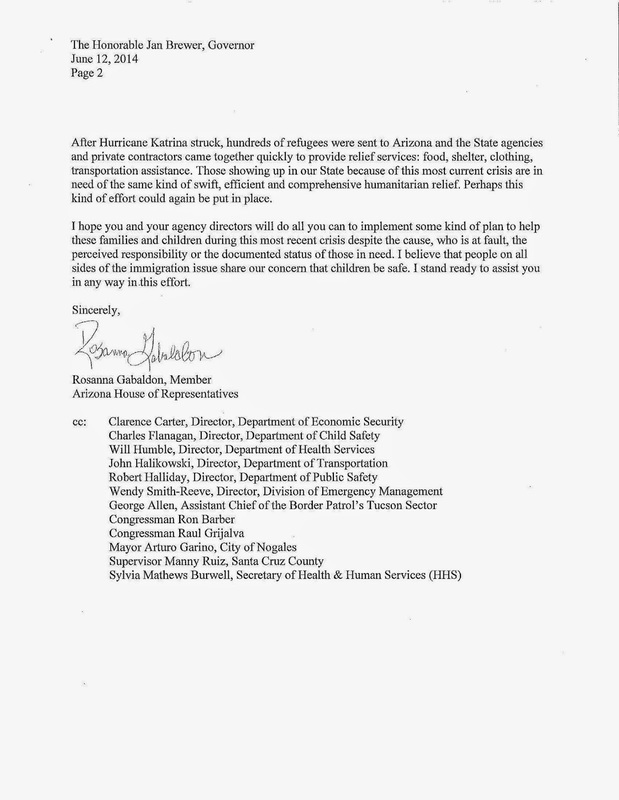 In her letter to the governor, Gabaldón added that, following Hurricane Katrina, state agencies and private contractors quickly came together to provide relief services for hundreds of refugees who came to Arizona. NOGALES, AZ – Three Arizona state representatives visited the U.S. Customs and Border Patrol youth detention center yesterday. The three Democrats, Rep. Rosanna Gabaldón, D-Sahuarita (District 2), Rep. Stefanie Mach, D-Tucson (District 10) and Rep. Demion Clinco, D-Tucson (District 2), were some of the first to see the developing situation at the border. The three representatives toured the makeshift shelter facility that has been fashioned from a commercial warehouse converted in the 2000s to a detention center. The shelter was set-up in response to the increases in unaccompanied minors being detained as they cross the border in to the United States. The group was told the facility, which was designed to accommodate up to 2,500 adults, was shuttered in 2009 and reopened last week for this new increase in unaccompanied youth cases. The state lawmakers observed that the detention center was equipped with evaporative cooling, chain link fencing, razor wire and temporary bathrooms. It was clear to the representatives that the U.S. Customs and Border Patrol staff was working with other federal agencies to improve the conditions, with a goal of transferring children to other longer‑term facilities within 72 hours. The representatives said that the installation of temporary shower trailers, washing machines and other bathrooms was ongoing. Just two weeks ago the Arizona State Legislature passed sweeping reforms creating the Arizona Department of Child Safety. The three elected officials traveled to Nogales concerned by the reports that children within the borders of Arizona were at risk. The Representatives questioned how this situation was allowed to escalate and how the increases became a crisis, requiring U.S. Customs and Border Patrol to activate the facility. “The circumstances in Nogales underscore a system in crisis and the urgent need for comprehensive immigration reform,” Mach said. STATE CAPITOL, PHOENIX – Members of the Native American Caucus issued these statements regarding the passing of Chester Nez, the last surviving World War II Navajo Code Talker. Nez was 93 when he died. “Chester Nez was a hero for our tribe, our state, our nation and for the free world. The Navajo Code Talkers' pivotal contribution to the end of World War II was invaluable. “I am saddened to hear about passing of Chester Nez into the spirit world. Chester Nez was the last of the original 29 Navajo Code Talkers. With his passing, a chapter closes. The story of the critical role the Code Talkers had in the United States winning World War II continues to unfold. The Navajo people and the American people owe an enormous debt of gratitude to these young Navajo men who became the Code Talkers and developed a code that was never broken. “With the passing of Navajo Nation Code Talker Chester Nez the door closes on an era. From riding horses, to traveling to the moon, he witnessed and contributed to the greatest advancement of humankind the world has ever seen. Let us always remember the courage and sacrifice of our Navajo Code Talkers. I salute him and all our veterans. “Many thanks to Mr. Nez and the Navajo Code Talkers for their courage and contributions to our freedom. It is ironic that Mr. Nez attended an Indian Boarding School during a time that children were punished for speaking their native language and yet it was that same language that played a crucial role for U.S. communications during World War II. The Code Talkers developed a code that was impenetrable to the Japanese. STATE CAPITOL, PHOENIX – Rep. Jonathan Larkin, D-Glendale (District 30), and Rep. Kelly Townsend, R-Mesa (District 16), co-chairs of the Arizona Veterans Caucus, commend the American Legion for its plan to create a Veterans Crisis Command Center to help those affected by the situation at the Veterans Affairs Medical Center. The new Veterans Crisis Command Center, which is located at the American Legion Post 1, 364 N. Seventh Ave., Phoenix, Arizona 85007, will open on June 10 from noon to 8 p.m. It will also be open from 8 a.m. to 8 p.m. on June 11 and June 12. On June 13, it will be open from 8 a.m. until noon. Additionally, the American Legion Post 1 will host a town hall meeting for local veterans and community members at 7 p.m. on Monday, June 9. Members of the Arizona Veterans Caucus plan to participate. STATE CAPITOL, PHOENIX – Rep. Lela Alston, D-Phoenix (District 24), today received the 2014 Legislator of the Year Award from the All Arizona School Retirees Association. AASRA’s mission is to provide leadership and promote action on issues and services for the organization’s members. The organization encourages volunteerism in schools and political activities at the local, state and national level. Alston received the award during the AASRA conference in Phoenix. For more information about the organization and the conference, visit www.aasra.org.